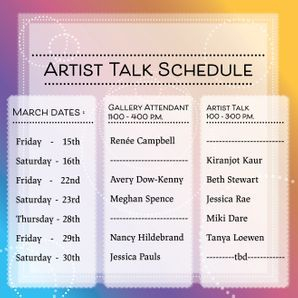 Come check out the Women in Art Exhibit being held this month at the Kariton Art Gallery in Abbotsford, BC. 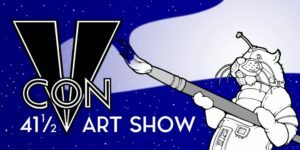 My artwork will be part of this exhibit that runs from March 9th to April 2nd. Come by and chat and have some appetizers at the opening night event on Saturday, April 9th from 6 p.m. to 8 p.m. March is International Women’s Month–a time to highlight the contributions of women to events in history and present day. The Abbotsford Arts Council curated this exhibit to celebrate women artists in the region. Paintings, prints and cards will be on display and for purchase by a range of great local women artists. The Nikkei National Museum and Cultural Centre in Burnaby is combining its spring festival with its 10th Annual BLOOM Art Silent Auction. 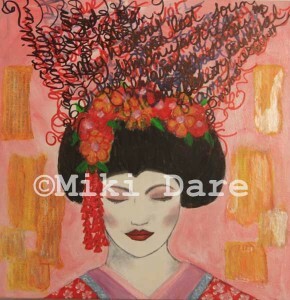 I will be donating art for the silent auction as will other local Japanese artists. Come out and pick up a painting, print or pottery to make your home beautiful and help support the Nikkei Centre. Here are a list of artists taking part so far: Mariko Ando, Miki Dare, Yoriko Gillard, Lori Goldberg, Sleepless Kao, Merry Meredith, Shinsuke Minegishi, Raymond Nakamura, Christopher O’neill, Claire Sower, Jeremy Isao Speier, Takao Tanabe, Sachi Yamabe, Instant Coffee, Yifei Zhang, Yurie Hoyoyon, Justine Miles, Michael Abe, Kathy Shimizu, Jeff Chiba Stearns, Audrey Nishi, Joyce Kamikura, and more. The silent auction is taking place on Saturday, April 21st, 2018 from 11:00 a.m. to 3:00 p.m. The Nikkei Centre Spring Festival will also be happening on this same date, so stay awhile and enjoy Japanese food, a tea ceremony, martial arts, dance, music,a bonsai display, and arts and crafts. There will also be a kids zone outside for children to take part in a variety of fun activities. You can also check out the Beta Vulgaris: The Sugar Beet Projects in the art gallery. This exhibit, by Kelty Miyoshi McKinnon and Keri Latimer, looks at the connection between Japanese Internment during World War Two and sugar beet farms. Japanese-Canadian families were told they could stay together if they chose to pick sugar beets in Alberta. Their forced labour covered about 2/3rds of Alberta’s sugar beet farms in the 1940s. There will also be a free film screening of Facing Injustice. The film looks at the relocation of Japanese-Canadians to Manitoba. I had a fabulous time at the “double the fun” book launch for Issue 16 of Pulp Literature and Tesseracts 20 in Vancouver. 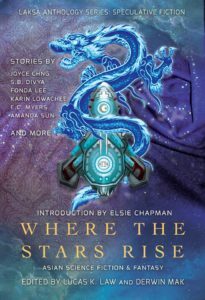 My short story “Grounded” is in the latter anthology, and it was my first time to read my published work in public. I was nervous to say the least, but had a blast once I got reading. The book launch was on September 18, 2017 at the Cottage Bistro, Vancouver. It was a terrific venue, and I enjoyed meeting fellow writers and readers. As per Pulp Literature’s website, “attending litterati from Pulp Literature include feature author kc dyer, cover artist Akem, Patrick Bollivar, Erin Kirsh, Magpie Poetry Award judges Renée Sarojini Saklikar and Daniel Cowper along with Magpie runner-up Glenn Pape, JM Landels, and Susan Pieters (who has a story in both books).” The Tesseracts 20 list included Susan Pieters, paulo da costa, Linda DeMeulemeester, Steve Fahnestalk, Catherine Girczyc, Roxanne Gregory, Matthew Hughes, Guy Immega, and Rhea Rose. Thanks to the folks at Pulp Literature for organizing such a wonderful event. 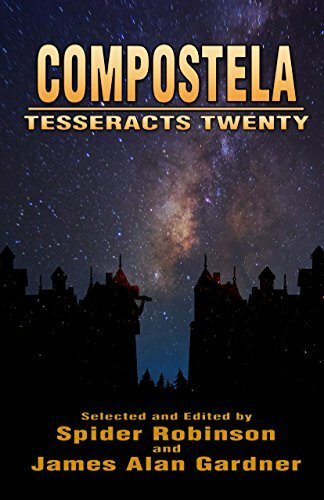 I’m on cloud nine that my story “Grounded” is in the new anthology Compostela: Tesseracts Twenty which is now available exclusively on Amazon. 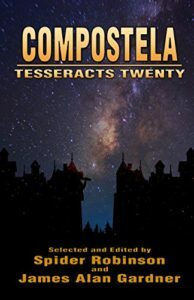 Edge Science Fiction and Fantasy Publishing puts out a Tesseracts anthology each year, and it features work by Canadian science fiction, fantasy and horror authors. According to Edge’s website, “Some of Canada’s best known fiction writers have been published within the pages of these volumes – including Margaret Atwood, Susan Swan, and Hugo and Nebula award winning authors William Gibson, Spider Robinson, and Robert J. Sawyer.” I am happy to say that in this 20th edition, I share the pages with Robert J. Sawyer. How fabulous! 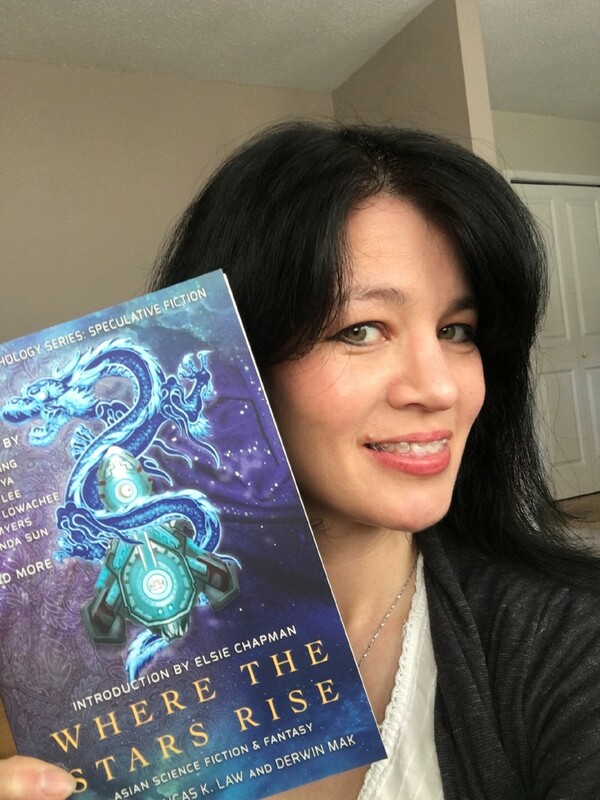 It’s also wonderful to be in an anthology edited by Spider Robinson because he was my first direct connection to the world of science fiction writers. He was a writer in residence in Vancouver awhile back, and I went in to see him about what he thought about my writing. I basically wrote science fiction as a social hermit, as most of my friends don’t read it. I was ever so nervous, and he was ever so kind. He said to go on and start sending out stories; and that’s what I did. Here I am now!